Starting a business is an exciting and nervous venture. Startups face different challenges than businesses opened only a decade ago. With the growth and evolution of the internet, businesses have the opportunity to connect and engage with customers both on and offline. Today, having a website for your business is a necessity. No longer are the days that businesses simply take out Yellow Pages Listing and market within their community. Shockingly enough, small businesses are still utilizing word of mouth as their primary source of marketing, according to CNBC’s 2017 Small Business Survey. While word of mouth is still a viable marketing tactic, owners are missing out on a great opportunity to reach customers online. Customers turn to the internet for reviews, referrals, business information, and customer service. To reach and engage with these customers, businesses need a company website. With the availability of website builders, such as Weebly, this is no longer an expensive and daunting task for small business owners. Weebly is a great resource for entrepreneurs and small businesses to build their site and engage with current and prospective customers. With their drag-and-drop builder, owners can easily customize professional and appealing sites. In the age of Google, customers expect to be able to access useful information on any topic, event, business, product, or idea with the click of a button. A company website will serve as the central location for small businesses to provide this information to prospective customers. Using Weebly, small business owners can easily create and launch an informative and alluring site for customers to access pertinent information about their business. With their drag and drop builder, Weebly has made it easy for small businesses to create their site with little to no technical expertise needed. To begin, business owners choose between 45 themed templates for their site or online store, then simply edit and customize the site with their information. For those with technical experience, owners also have the option to edit their template via the source code to fully customize and design their site. Weebly’s online store site packages range from $8/month with their Starter Package to $38/month for their Performance package. For the number of features, storage and support that each package comes with, Weebly is providing premium resources to business owners at very reasonable rates. In 2016, Google announced the number mobile search queries surpassed desktop queries, with mobile queries amounting to more than 50 percent of searches globally. Although the exact difference between mobile versus desktop queries is still unknown, it is important for businesses to have a mobile-friendly site for the on-the-go customer. “Weebly is always built with the mindset that our product must first be optimized for mobile,” said Kim Chappell, Head of Communications at Weebly. Luckily for business owners, Weebly has alleviated the trouble of creating a mobile-friendly site by designing responsive templates. This puts Weebly and its users ahead of the curve of Google rolling out their mobile-first indexing come July 2018. This means for mobile search queries, Google will begin crawling and indexing mobile sites first, instead of the desktop versions. By having a mobile responsive site, business owners can be assured the on-the-go customer can find and access their site with ease. A common misconception among small business owners is believing traffic will automatically come to their site once it is launched. Weebly not only recognizes the importance of creating a website for small businesses but marketing the site itself. When it comes to finding and attracting new customers online, creating a website is only the first step. Small business owners must then expand their web presence in order for customers to find their site. A key strategy to gaining traffic and attracting customers online is SEO. The purpose of SEO is to optimize a site to improve its visibility and ranking among organic and free search engine results. According to Internet Live Stats, Google processes more than 40,000 search queries per second, equaling to more than 3.5 billion searches per day. The traffic, and potential customers, will come to the business’ site if they are ranked highly among those search results. Knowing the benefits of SEO for small business, Weebly made their SEO features available in all of their site packages to help owners easily navigate their digital marketing efforts. For those wanting a more in-depth knowledge of SEO, check out our SEO Guide. It thoroughly details SEO practices starting from site building to tracking analytics. For small business owners selling products online, Weebly designed their online stores with search engines in mind, making it easy for customers to find them. “We have zeroed in on making marketing integrated into your site and store across the platform so it’s simple to use and is generating new visitors to your site,” said Chappell. Weebly has additional free features available for site optimization through ecommerce SEO. As business owners build their online store, Weebly automatically produces their ecommerce SEO features. These automated processes keep title tag and meta description creation easy and concurrent for business owners. Weebly offers other digital marketing integrations for sites that go beyond SEO efforts. These features give businesses the opportunity to expand their customer engagement and reach customers across multiple channels. Weebly’s integrated email marketing platform, Weebly Promote, connects to the business’ site and helps with lead capture, customer segmentation which aids in the development of email campaigns. Campaigns can be formed around various target groups based off customer behavior, auto import of products, logos and colors. Business owners personalize Promote’s professional layouts and templates to send different email types including newsletters, promotions, and announcements. Additionally, owners can create automated emails to be sent when activated by triggers. “[Promote] autopilots important communication like order tracking emails, abandoned cart email and even happy birthday emails to drive customers back to your online store,” Chappell said. This provides small business owners an effective way of remaining in communication with customers without needing to manually send out each individual email. Another digital marketing strategy available for business owner is retargeting via social media advertising. Retargeting allows owners to reengage customers and drive traffic back to their site, and potentially leads to more conversions. “We’ve recently released a simplified connection to Facebook Ads which allows you to retarget your store customers that have left products in the shopping cart online or allow those who have visited your site or store to see paid ads of your product on their Facebook feed,” Chappell said. Owners can access and control this technology via their Weebly dashboard. At a glance, owners are able view the metrics, health of the marketing campaign and, most importantly, how much money it’s driving for the business. Always keeping the betterment of their users in mind, Weebly has formed strategic partnerships that will continue to hold their share in the site builder market, and possibly grow their competitive advantage amongst their competitors. The latest being announced that Weebly was acquired by Square. For small business owners, the fully integrated Square and Weebly partnership will provide significant benefits for growth. Combined with Weebly’s already integrated email marketing platform and social media advertising, the acquisition has unlocked the opportunity for business owners to create an omnichannel experience for their customers. 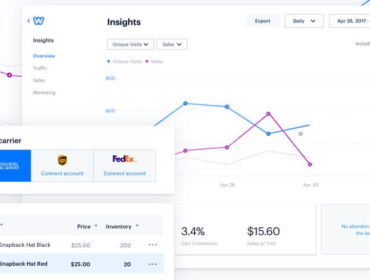 Weebly’s current partnership with multi-carrier shipping software, Shippo, is already delivering substantial savings for online store owners. Shippo is now fully integrated into Weebly’s newly released Commerce 3.0 creating a “smoother backend experience for merchants” and saving them up to 40% off shipping costs and printed labels. Weebly continues their development and improvement with the best interest of their users in mind first. Moving forward, these partnerships create a unified, one-stop shop for small businesses and online stores. The potential return on investment is undeniable for small business owners utilizing all of Weebly’s features. From site building to digital marketing to ecommerce, Weebly has managed to simplify each step for business owners navigating into the digital spaces at an affordable cost.